Your WordPress Media Library can be one of your greatest allies when it comes to creatively displaying lists in your pages, posts and widgets. Lists can be one of the most efficient ways of conveying information to users of your WordPress site. We all use ’em (some sparingly, some extensively) to highlight important elements in the body of our posts and pages. If you use lists on your site, creating different list types for different needs can help your users intuitively grasp what the information is designed for. From custom bullets, to background images, to clickable grid displays, you’re limited only by your imagination… and maybe your CSS skills :-) This tutorial will guide you on the basics of creating some really nifty stuff! Give your list a special class when you’re adding it to your page, post or text widget. Upload an image to your WordPress media library to use as a bullet. Add a little bit of CSS to your style-sheet to grab that icon for your custom list. 1) Let’s say you want to create a list of favorite items and will use a star icon like the example above. In your post editor (or page or widget), simply add a class name to the <ul> tag of your list, like below (you can name it anything you like). You’ll need to switch to the HTML tab if you’re using the visual editor to do this. 2) Remember to Save your post! Then go to your WordPress media library to upload a new image. Once you’ve uploaded the image you want to use for your custom bullet, copy the File URL. Add custom styles directly to the theme’s style.css file. Add them via the “Theme Editor” in your WordPress admin area. Whichever method you choose, first define the selector to use. In this example, we’re targeting the list items (li) of our unordered list (ul) to which we gave a class name “fav”. That becomes ul.fav li as below. The style rule to use is list-style-image. That will replace the bland little square, dot or dash with your fancy new icon in any lists you assign the “fav” class. (Obviously, the image File URL you copied earlier goes where it says ‘FULL-URL-TO-YOUR-UPLOADED-IMAGE-GOES-HERE’). Save and/or re-upload your style-sheet. Then, go refresh the page you added your custom list to. You should see your new custom bullet before each item. You can create as many lists with custom icons as you like in this manner. Just remember to give each list-type a distinct class name that you make up, and that has no risk of conflicting with existing WordPress classes. Otherwise, you may wind up seeing your bullet icon showing up on your site in the strangest places! Note that the icon images you use for custom bullets should be small; 16×16 pixels is ideal. One of the most commonly used icon sets around is FamFamFam. 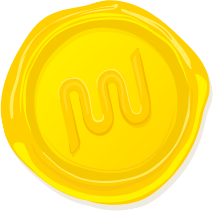 Or, if you really want to go nuts with icons, check out over 30,000 of them at FreeIconsWeb. Making an image list can really help to spruce up an otherwise bland display of choices for users of your site. This part of the tutorial will show you how to build a list with clickable images like in the example image below. The process of building a list with background images is quite similar to creating custom bullets. There are a few details that differ however. Let’s take it step-by-step again. 1) This time, along with adding a class name to the <ul> tag like we did for the bulleted list, we need to identify each list item (<li>) with a specific ID. This is required only if you want unique images for each list item; if you’ll be using the same image for all items in the same list, there’s no need to give each a separate ID. Again, you can identify them with any names you like. Below is the code I used to create the list in the image above; go ahead and copy it to your test page. 2) Upload your images to your WordPress media library. For this step, please don’t just upload any old images you have lying around on your computer. Get creative and design them. It’s important that they be all the same size, and exactly the size you want for your list items. If you want to use the same .png images I used for the list item backgrounds in this example, and follow along by copy/pasting everything, you can grab them in a zip file here: http://www.filedropper.com/custom-bg_1. Once you get yourself familiar with how it all works, you can create your own. Once you’ve uploaded your images, copy the File URLs to a blank Notepad file (no need to save it, just keep it handy for the next step). 3) For lists with a different background image in each list item, we’ll need to style more than just the <li> tag. We need to make the links (the <a> tag) the same size as the background images. 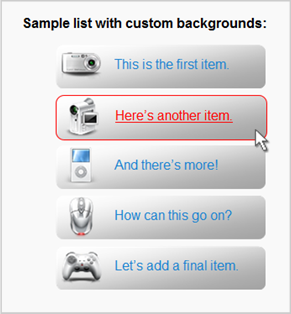 Also, we define the background images for each item by assigning them to the <a> tags to make everything clickable. Copy the following to your style-sheet and save/re-upload. A little explanation of the above CSS may be in order here. Although the images (if you’ve used the ones from the zip file above) are 250×52 pixels, the list items (ul.gizmos li) have a height of 60px to create a bit of vertical breathing room between them. The links (ul.gizmos a) are set to display as block so we can define their width and height. The dimensions of the links have been set to 170x42px to accommodate the padding; 80+170=250px for the overall width, and 10+42=52px for the overall height. The padding is so the small line of text in each link appears centered. If you don’t want the padding, remove it or adjust it as it suits you, but remember to adjust the dimensions of ul.gizmos a accordingly. Go ahead and experiment a bit with using your WordPress media library as a base for clickable lists with background images. The more you play around with things, the more you can discover how to improve upon them. How about a clickable grid? Making a clickable grid display like the image below is almost exactly the same process as with a clickable list like we just made. The only real differences are a few small modifications to the CSS (and properly formatted images, of course). 1) To make this same grid display as an example to play around with, here’s the code to add to your page or post. The ul.gridlist has a max-width applied to ensure it only displays 2 items across. If you want it to display 3 or more across, simply increase its max-width to accommodate the additional width of more list items. The list items themselves (ul.gridlist li) are a bit bigger than the images to ensure a bit of spacing. The list items have also been set to display:inline-block; that’s what ensures they show up in a row. The vertical-align:top is there so they all line up nicely with each other. As a final detail (that I forgot in the previous exercise), I’ve added text-decoration:none; to the links when hovered over so we don’t get that ugly underline. On a final note, with the upcoming release of WordPress 3.5, the WordPress media library is in for a bit of an overhaul. Among the new features that should be included will be a way to categorize your media. Ooh, fun!